Representatives from the West Virginia School of Osteopathic Medicine and Davis Medical Center congratulate Davis & Elkins College students on the successful completion of the Green Coat Program. From left are Dr. Frank Swisher, assistant dean at WVSOM; Janet Hinton, Rural Health Initiative Program coordinator at WVSOM; D&E students Kirsten Gateless and Alyssa Edwards; Valerie Bright, coordinator of volunteer services at Davis Medical Center, who served as Green Coat Program organizer; and Vance Jackson, chief executive officer of Davis Health System. ELKINS — A unique internship with one-on-one interaction has reinforced career decisions for two Davis & Elkins College students. Alyssa Edwards and Kirsten Gateless say medical school is in their plans after completing the Green Coat Program provided by the West Virginia School of Osteopathic Medicine (WVSOM) in Lewisburg, W.Va., in conjunction with Davis Medical Center. 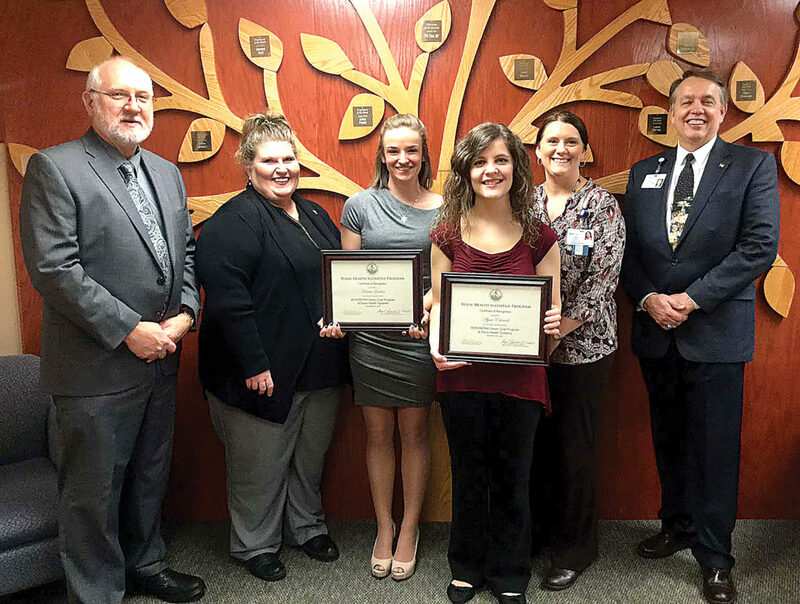 The two are the third group of Davis & Elkins College students to participate in the program that includes more than 100 hours job shadowing physicians and other health care providers to gain an in depth perspective of the professions. “I learned so much that would have been hard to learn anywhere else,” said Gateless, a senior from Flatwoods. Early in her college career Gateless was worried that she may not get the chance to experience job shadowing in the medical field because of the small setting of the community and the college. When the opportunity arose to participate in the Green Coat Program, she says she was excited to take on the challenge. For Edwards, a junior from Fairmont, fitting in the required internship hours along with her classes as a biology major was a big commitment, but one that was well worth it. “This is a really good program for anybody looking at the health care field because you gain a wide variety of experience at the hospital and you learn so much,” Edwards said. 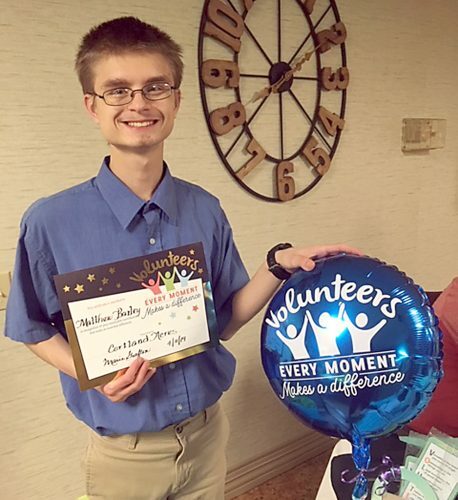 The program included more than a dozen different health care settings: outpatient lab, clinical lab, Cancer Care Center, operating room, outpatient clinic, inpatient physical therapy, pulmonary department, emergency department, radiology, day surgery, pharmacy, case management, palliative care, telemedicine, Lifeskills class and nursing rounds in three units. Gateless said she especially liked a turn in the operating room where she observed a total knee replacement. Edwards, who hopes to become a pediatrician, said her time shadowing Dr. Philip J. Chua, a hospitalist at DMC, provided an invaluable experience. The Green Coat Program is provided by WVSOM’s Rural Health Initiative with financial assistance as a grant from the West Virginia Higher Education Policy Commission. Open to college sophomores and juniors who are interested in medical school or a health care profession, the Program provides daily interaction in a hospital setting.